Aymee has the pink flower in her hair and Melodee has the purple. My camera was giving me some trouble. Happy 9 Months dear twins! Happy, Happy Birthday dear son!!! -Educating the Wholehearted Child, Third Edition, page 279. I was startled to learn in early March that we were expecting our ninth baby- startled enough to take five separate tests. Yes, I did. And every one showed two bright pink lines. Yet, from almost the beginning, I sensed that all was not well. However, God in His sovereignty and providence, did allow me to see a sweet little baby of 7 weeks gestation with a heartbeat before the little life that He created did, indeed, end. Miscarriage. What a word. What a journey, what an experience. Truly something I have realized that you can’t understand until you walk through it in all its pain and physical experiences… truly something that seems to call deeply to the hearts of others and they are quick to share the secret, quiet sorrow of their own hearts in shared experiences. How she whispered quietly to me ,the receptionist at the doctor office, of the loss of her twins 3 1/2 years ago at 8 and 9 weeks gestation- and how she couldn’t even talk about it for months and months- I just wince and brim tears. And how he- just stopped, right there, in the triage room- just stopped detailing down his list- to offer me his personal, heart-felt sympathy and share how he and his wife knew this pain. I stare at him. My mind thinking of the tasks and ordeal at hand. But later, later, I rock sweet baby girl and brim… and how, she, dear friend, hurried to message me true and detailed council so I could be informed and not afraid… and another, sister, drew forth the comfort for me with which the Lord Himself had comforted her, and she covered me in it, like a blanket, like a blanket of love… and o, dear brother, a kindred spirit, who drew the waters from their deep wells to process deep…there are too many to write here. I could go on and on… and every story now twines with mine bringing meaning and healing and hope and understanding. O, truly the Lord has been kind and faithful in this hurt I was not expecting. My heart grieves and my eyes brim and my throat chokes at this loss. It hurts. The most sorrowful thing for me is that sense of a life that was alive and growing within me- just- being gone. My soul and spirit grieved its loss- even when my mind was elsewhere. I found a deep soul grief welling up within me and tears flowing right before I actually lost the baby- even though I had “known” in my mind that the baby was gone for several days. It just came from deep within- and I know it is that precious soul connection the Lord has designed between mother and child… the mystery of the connection God has designed. A Secret, Quiet Sorrow tucked deep into my heart- and how strange- how strange it feels and is. Our family has chosen some things to mark this loss with personal meaning and some dear friends have recommended some resources to me that I am still looking into- so I can’t share or give any kind of review. and although we will not know this life here on earth- I “knew” it within in the deep and secret way of mothers. My heart aches this loss. 189-Wild, white dogwoods in full bloom. 191-Bright Mountain Sun shining gold on face, shining thru unfurling green, wee new leaves. Spring green. 194-A bouquet of tulips, tulips from my love. Pink and bright, strong and tall. 204-a mountain drive and the spring color- just popping- glory beautiful and everything fresh and fragrant and how there are these trees that just flame to life in multiple colors- reminding me of certain tress that flame their autumn dying all hues together- and I marvel at the beauty. 210- three blowing dandelion fluffs in the afternoon sun and spring green, tiptoeing and blowing over the side of the deck. Walking through an unexpected trial of fire, water, and blood… these verses comfort me. Hard Eucharisteo. Matt. 26:38: Then saith He unto them. My soul is exceeding sorrowful, even unto death: tarry ye here, and watch with Me. The Lord help each one of us to “stand by” one another with just this kind of bracing sympathy. This Scripture came to mind when I was pondering creating these Easter baskets. I want to make the most of every opportunity to minister to my children and impress God’s love and truth upon their hearts. Easter is a wonderful opportunity to love my children in Christ’s name and for His sake. Our house is currently very cluttered and messy. This made me want to focus on cleaning and not on preparing gifts for the children. But then I remembered- my children will remember the memory and love of this day. They will not remember the clutter and untidiness and what memories and images did I want to impress upon their hearts and minds? I chose love. 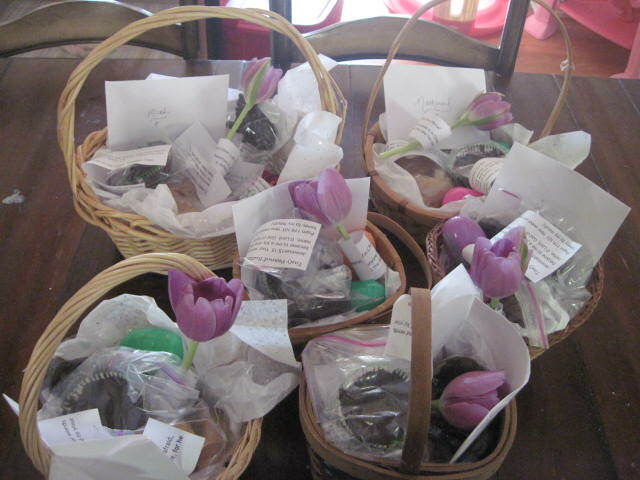 I attached a Scripture to each of the main ingredients in their baskets. I also thought about a meaningful Scripture for each child and printed it and handwrote an encouraging note on the back. 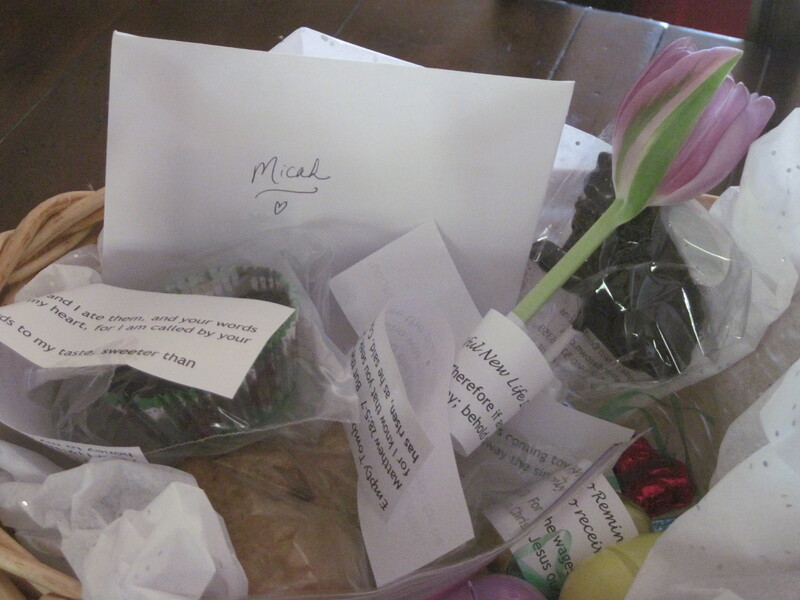 A dear friend of mine was kind enough to share some things with me about their Easter baskets and celebrations and I felt inspired in the Lord. 2 Corinthians 5:27 Therefore if anyone is in Christ, he is a new creation. The old has passed away; behold the new has come. Golden Eggs to Remind of us of the Precious Gift Christ is- we need only to receive Him! I was very pleased with their beauty, simplicity, and meaning. I also made homemade peanut butter cups for our children this year- and they were so easy and delicious!! They are so much more healthful than the store-bought alternative. They are also safe for our food allergies! 🙂 They are definitely a new tradition. Happy Easter! Blessed, Blessed Resurrection Day.